Former President Barack Obama speaks on a panel at the University of Chicago on Monday. The event marked an end to Obama’s self-imposed silence following Inauguration Day earlier this year. 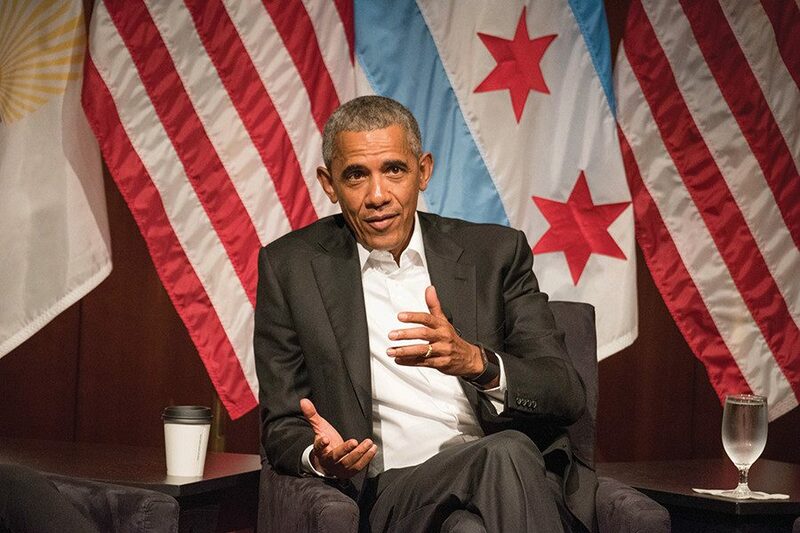 CHICAGO — Former President Barack Obama cautiously avoided discussing his successor as he returned to the spotlight Monday, in his first public event since leaving the White House earlier this year. Instead of discussing Trump, the 44th president used a roughly 80-minute discussion in front of a student-dominated crowd at the University of Chicago to stress the importance of civic engagement and set the tone for his post-presidential career. “The single most important thing I can do is to help … prepare the next generation of leadership to take up the baton and to take their own crack at changing the world,” he said. Monday’s forum, which included six young people and an audience of roughly 500, marked the end of a self-imposed silence Obama has maintained since Inauguration Day. Though he did not specifically mention Trump — who will reach his 100-day mark in the White House this week — the former president decried the state of immigration and lamented the polarization of politics. Obama acknowledged his failure to unite red and blue states, an “aspirational” goal that never came to fruition. He highlighted three factors that have prevented finding common ground and led to a more “individualistic society”: gerrymandering, special interests and the perpetuation of echo chambers in the media. “Everybody’s listening to people who already agree with them and are further and further reinforcing their own realities to the neglect of a common reality that allows us to have a healthy debate,” he said. The invite-only event was a homecoming of sorts for the former president who recently returned from vacation in French Polynesia. While in the Illinois state senate, Obama represented the Hyde Park neighborhood where UChicago is located and previously taught law at the university. Over the next month, Obama will appear at an awards ceremony in Boston and a public discussion at the Brandenburg Gate in Berlin with Chancellor Angela Merkel, according to the New York Times. Obama spoke fondly Monday of his time on the South Side, where he began his career as a community organizer decades ago. The conversation at UChicago comes at a time when Republicans are moving to dismantle the 44th president’s legacy. This week, GOP leaders renewed their efforts to repeal and replace the Affordable Care Act, hot on the heels of recent action to reverse Obama-era environmental protections and gun limitations. And earlier this month, the senate confirmed Neil Gorsuch to the U.S. Supreme Court after Republicans refused to hold hearings on Obama’s pick, D.C. Circuit Court Chief Judge Merrick Garland. But on Monday, the former president made no mention of Trump — upholding an inveterate tradition not to criticize executive successors. After speaking for roughly 10 minutes, Obama posed a series of questions to the six-person panel on topics ranging from civic engagement to polarization on college campuses. The former president asked UChicago undergraduate student Max Freedman about political correctness. Freedman — the panel’s lone Republican — admitted to feeling somewhat ostracized on a largely liberal campus, but called it an “honor” to defend his views and encouraged more empathy. Closing the forum, Obama described young people as a possible antidote to Washington’s division and encouraged the crowd to remain politically active. Some students who attended the remarks were disheartened by Obama’s decision to abstain from critiquing his successor. Simran Chadha, one of roughly 20 Northwestern students at the talk, said she couldn’t help but be disappointed by Obama’s impartial comments and adherence to tradition. The Communication junior, a fellow at the Center for Civic Engagement, said while it was inspiring to see Obama place his “hope and trust” in young people, she wished he had made a louder call to action.